One month ago, when Apple finally crossed above $1 trillion in market cap, Goldman's chief equity strategist David Kostin said that investors had been focusing on the "wrong $1 trillion question", adding that the correct question was: what amount of buyback will companies authorize in 2018? 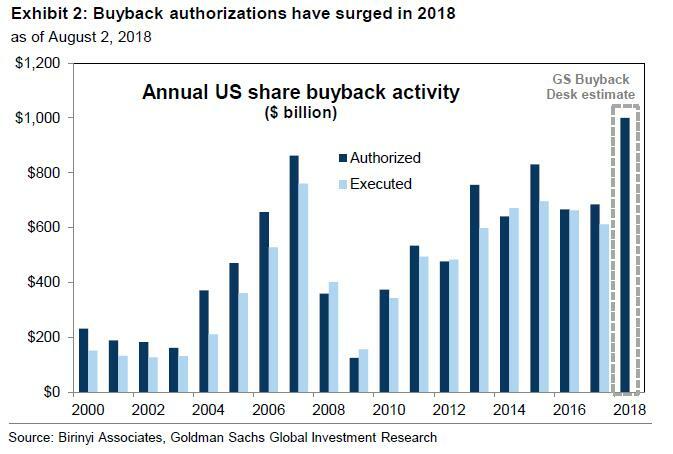 The reason was that according to the latest estimate from Goldman's buyback desk, stock buyback authorizations in 2018 had increased to a record $1.0 trillion - a result of tax reform and strong cash flow growth - a 46% rise from last year. The upward revision was warranted: according to TrimTabs calculations, buyback announcements swelled to a record $436.6 billion in the second quarter, smashing the previous record of $242.1 billion set just one quarter earlier, in Q1. Combined, this meant that buybacks in the first half totaled a ridiculous $680 billion which annualized amounted to a staggering $1.35 trillion, indicating that Goldman's revised estimate may in fact be conservative. 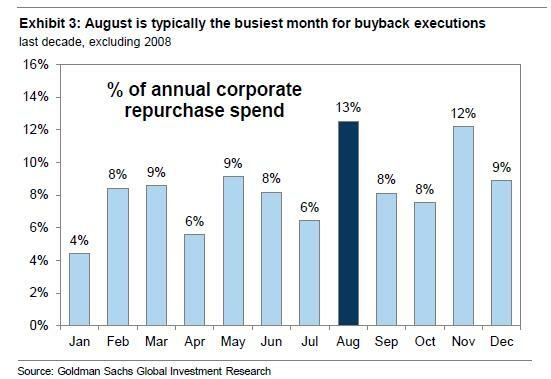 Furthermore, with many strategists warning that August could be a volatile month, Goldman remained optimistic noting that "August is the most popular month for repurchase executions, accounting for 13% of annual activity", implying that a solid buyback bid would support the market in a worst case scenario which never materialized as the S&P rose to a fresh all time high at the end of the month. As CNBC further notes, September is usually the worst month for stocks, possibly explaining why corporate executives sold so much stock last month. Data from the "Stock Trader's Almanac" show the S&P 500 and Nasdaq both fall an average of 0.5% in September. The Dow Jones Industrial Average, meanwhile, averages a loss of 0.7% in September. 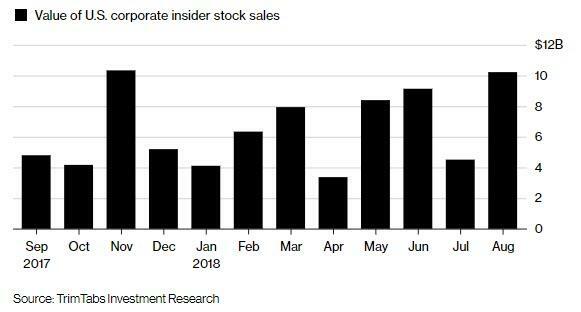 "One cautionary sign for U.S. stocks is that corporate insiders have accelerated their selling of U.S. equities,” said Winston Chua, an analyst at TrimTabs. “They’ve dedicated record amounts of shareholder money to buybacks but aren’t doing the same with their own which suggests that companies aren’t buying stocks because they’re cheap." it's already been a tough start to the month of September for the S&P 500, which has fallen for the fourth day in a row. This is notable, as LPL Financial notes "going back to the Great Depression, only two times did it start down the first four days. 1987 and 2001."